Create static definitions of these components with docker-compose to share between development environments. 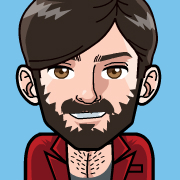 Script the creation of my own components with Dockerfiles and use them in docker-compose.yml to facilitate the development of distributed architectures. Use a private docker registry to publish my images and use them in docker-compose.yml. Create alternative docker-compose.yml files to use them in deploys. Although docker-compose and docker-machine certainly help in all these ways, as the infrastructure grows both horizontally and vertically you will need to start thinking in terms of herd/cluster of servers, and the process will grow in complexity if you do not have specific tools for this purpose. The solution proposed by Docker to solve this problem is called Swarm. Next I will make a walk-through on the configuration of a Swarm and deployment of a micro-services application on a 3-server infrastructure. To follow this step-by-step, you should start from a host with the main docker tools already installed (docker, docker-compose and docker-machine). I will be using an Ubuntu host, although the same can be achieved on Windows, Mac or other Linux distros, with just minor changes. It is also required to have Virtualbox installed for the creation of virtual machines. I will try to focus on the commands referring specifically to Docker Swarm, so a basic notion of the mentioned tools is also recommended. The first step to get a Swarm is the creation and provision of the machines that will serve as nodes for the cluster. 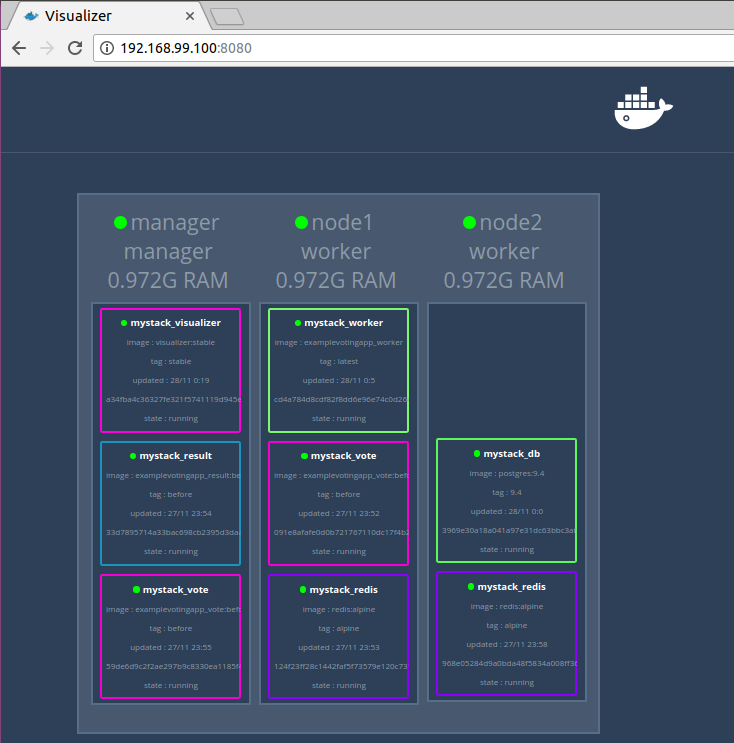 In our case we are going to use docker-machine to provision 3 virtualbox machines in our host, but it is important to stress that this is not necessary for the creation of a Swarm. It's actually enough to have hosts that can communicate with each other through the ports that docker require (for example, different EC2 machines in AWS). At least one of the nodes of a Swarm will have the Manager role, while the others will be Workers. The Manager node will be the entrypoint for all the operations we do with the Swarm. It is worth mentioning that the Manager nodes also function as Workers. It is important that we save the IP of the manager node (192.168.99.100). We will need it soon. The next step is to initialize the Swarm from the manager node and subscribe the workers. Swarm initialized: current node (6wnrcrp7s1qdep5i33uu9whx1) is now a manager. The --advertise-addr flag specifies the address that the Workers will use to register to the Swarm. Here we can choose the best address depending on the environment, it could be a private or public one. Here we will use the one docker-machine gave us (192.168.99.100). Once we have Swarm created in our Manager node, we should now register the Worker nodes. If everything worked fine, we will get a view of all the nodes that make up our cluster, indicating which is the Manager (Leader) and the status of each one. Tasks are located one level below the Services, and represent specific instances of them. They are merely containers running within a compatible node. Swarm will start a Task for each replica that a Service require. the Nodes are the work units that Swarm will have to run the Tasks. Being a Manager, a Node will also be the host docker from where we can interact with the Swarm. As you can see, a docker-stack.yml is very similar to a traditional docker-compose.yml. The main difference is the addition of the deploy element, which is used by Docker to customize the deployment options for our Services in the context of a Swarm. In our example we only use a few deploy options, but it is worth diving in the documentation since here lies the greatest power of Swarm. The last argument is the name of the Stack, which will serve as a prefix for all Services and for use in certain commands. From this moment, Swarm will begin the deployment, creating a Task for each one of the replicas of our Services, which will end up being simply a container in one of the available nodes. Here we can see the number of replicas started for each Service. We can see some of them are not up yet. What's interesting here is that we can see in which node each task is running, besides any error that we may have. You probably noticed one Service in the stack called visualizer that was not part of our application. This component exposes a web page with a graphic representation of the Swarm, updated in real-time, together with relevant details of each Task. If you stopped to look at the address bar of the previous image, you may be wondering how that url ends up showing the content of the visualizer Service. Before explaining any further, open your browser and go to http://192.168.99.100:5000/ (if you haven't already done so) and contemplate a shimmering Voting app running inside the Swarm! So, what has just happened here? Service Discovery: Each Service can make use of a Swarm public port to publish inner ports and become reachable. Access to a Service is achieved pointing to the IP of any node of the Swarm on the published port, even if the service has no running Tasks on that node. Load Balancing: For Services running more than one replicas (Tasks), you will get Load Balancing for free when pointing to a service. We can verify the Load Balancing feature refreshing our vote page a few times and checking the container where it's being served from. Docker Swarm offers this and much more regarding container networking on distributed infrastructures, you can dive in the documentation to learn more. Without having tried alternative products (such as Kubernetes) yet, I definitely recommend getting into Docker Swarm to kickoff / expand your devops skills. Deploying a Swarm on AWS, caveats and considerations. Leave me a comment telling me which ones interest you the most!